Grocery-wise, everything I like tends to disappear eventually. At the grocery in my building, this happens quite a lot. That feta I liked? Gone after a few months. Those No Brand hot dogs I liked? Gone, too. My favorite brand of grape juice? Gone. The reverse also happens: things that I've been pining for will suddenly appear unbidden, and often when I don't need them. Also: I now know that red onions aren't called "홍양파" in Korean. 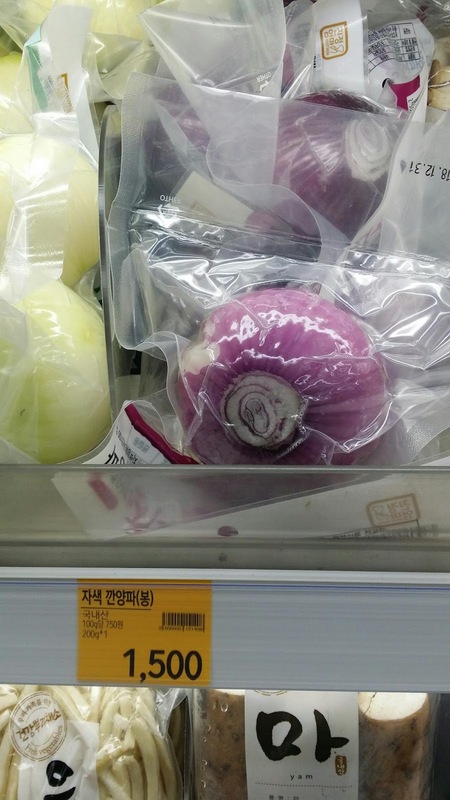 Per the label you see above, they're "자색 깐양파," i.e., (peeled) purple onions. Which makes sense: they really are purple, just as "red cabbage" is actually purple.